Hedgehogs tend to be shy, solitary creatures that are generally nocturnal (active at night). Many prefer quiet, dim environments and are frightened by loud noise and bright light. They like to hide and dig and have a well developed sense of smell. They try to “taste” new things in their environments by salivating and spitting onto themselves − a process called “anointing” or “anting. Hedgehogs are covered by short, pointy spines. 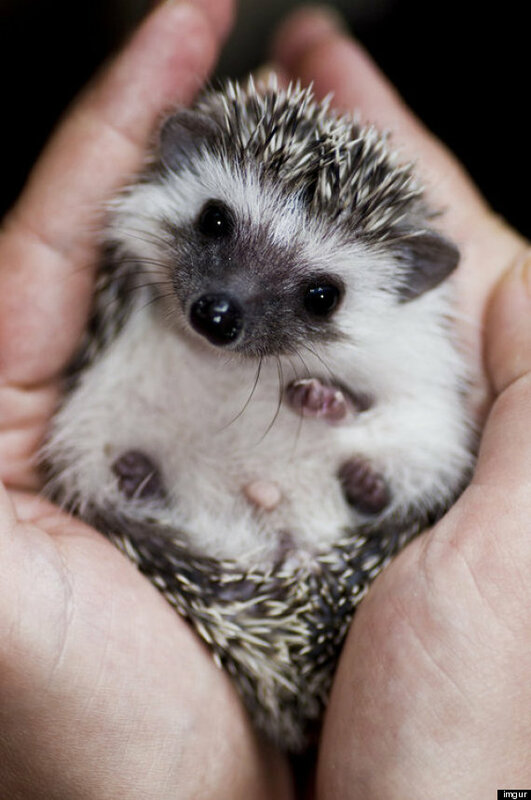 While young hedgehogs usually do not mind being held, adults often roll up into tight balls as a defense if they have not been well- socialized. Adults may also make a hissing sound when they are afraid. With quiet stroking of the spines over the back in dim light, a curled up hedgehog may uncurl. The more a hedgehog is handled, the tamer it is likely to become. Hedgehogs live 6-10 years in captivity with proper nutrition and wellness care! They can be fertile by 2 months of age, but females should not be bred until they are 6 months. For more on breeding go to http://www.hedgehogclub.com/breeding.html . Hedgehogs can be housed in smooth-walled enclosures (such as aquariums, 20 gallon capacity or greater) with sides high enough to prevent escape. They can also be housed in plastic bottom enclosures with coated wire sides and top, such as those made for rabbits or guinea pigs. Cages with wire sides and tops have much better ventilation than aquariums and are therefore healthier for hedgehog’s respiratory systems. Do not house hedgehogs in cages with wire floor or with wire “ladders” as their feet could easily become trapped and and injured in the wire. Click Here for more suggestions. Hedgehogs are not good climbers and care should be taken to ensure they live in a one level environment. Exercise wheels should be provided. They should be completely solid to prevent feet and spines getting caught in wires or holes. Hedgehogs are prone to obesity in captivity and providing them with a safe method to exercise is critical. A recycled paper product such as Care Fresh(R) is a good bedding. Bedding should be several inches thick to enable digging and should be kept clean and dry. You can also use fleece or flannel squares that can be changed out and washed daily. Wood shavings and soil are not recommended, as they are dusty, indigestible, and may contain parasites. They are also dangerous to hedgie eyes and respiratory systems. Hedgehogs should be provided with a hide box, a shallow water pan for bathing and a litter box with pelleted paper product for litter. Tubes may be used to enrich their environment and provide varied resting places. For more on housing needs Click Here. In the wild, hedgehogs do not hibernate. However, in captivity they may hibernate if their environmental temperature falls below 65 degrees. As hedgehogs do not appear to have a need to hibernate, and hibernating may be detrimental to them, it is ideal to keep them at a constant temperature throughout the year of approximately 70-80°F, as well as to keep them on a 12 hour light cycle. Hedgehogs are, by nature, curious, active foragers. They should be taken out of their enclosures every day for exercise and social interaction. They should never be left unsupervised, as they may chew on toxic substances or be attacked by other predatory pets, such as cats and dogs, or injured by small children. Watch this Video of Hedgehog playing with a kitty jingle ball! Hedgehogs are in the insectivore family; however in the wild their diet includes insects, snails, worms, as well as occasional small vertebrates (like mice) and plants. They should be fed once daily in the evening from heavy dishes that do not tip over easily. A good quality commercial pelleted hedgehog diet or low-fat dry cat food (Royal Canin(R) Lite Indoor food for Cats) make a good base for their diet. Each day, an adult hedgehog can be fed 2 tablespoons of a hedgehog diet or cat food, along with 1-2 tablespoons of fresh vegetables. They also require a few insects (mealworms, crickets, snails, other invertebrates) 3-4 times a week. Since hedgehogs are very prone to obesity, feeding unlimited quantities of food or feeding high fat foods (such as seeds and nuts, or waxworms) is highly discouraged. Fresh water from a bowl should be offered every day. Some hedgies will use a bottle, but not all. Newly purchased hedgies should visit to an exotic animal veterinarian for a good over-all well-health check and a dose of mite medication, as mite infestations are common. Take a fresh sample of stool (poop) to your vet for an intestinal parasite check, as well. Hedgehogs should be examined once a year by your veterinarian. Diet and environment should be reviewed. Hedgehogs should be weighed at least annually to ensure they are not becoming obese. They should receive a complete physical examination, including a thorough check of their teeth, as they are prone to dental disease. It is best if your veterinarian briefly anesthetizes your hedgie for a complete oral exam. Dental scaling may be necessary if they have excessive tartar. Hedgehogs can also be prone to hepatic lipidosis (fatty infiltration of the liver), cancer (especially oral cancer), respiratory infections, and certain neurologic conditions (Wobbly Hedgehog Syndrome). Proper preventative medicine can help avoid the development of disease and ensure the lifelong health of your hedgehog.